A Collection of Horse-cow Adventures follows the stories of Horse-cow, a mixed-up animal that belongs to a lady called Ella. The book follows Horse-cow as he embarks on small adventures that will encourage and excite young reader's imaginations. Each short story sees Horse-cow facing a challenge. When Ella and Horse-cow try to bake a cake, they drop a bag of flour, creating a huge mess which proves to be challenging to tidy up. During a boat trip, Horse-cow falls into the water and has to be rescued by the fishes. An afternoon walk is interrupted by a naughty orange dog with very short legs. But each story ends happily as Horse-cow drifts off to sleep. Inspired by the author's own experience of being given a soft toy that looked like a horse-cow hybrid, Maggi King's debut children's book is beautifully illustrated with fun and exciting pictures. It will appeal to readers aged 3 years and over, and those who are able to read along. 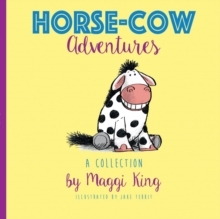 Many of the stories in A Collection of Horse-cow Adventures were inspired by Maggi's experiences of life in a wheelchair and learning how much she could do. The book aims to make young readers more aware of these challenges and to encourage the idea that though there may be difficulties, life in a wheelchair can still be fun.